The Collinsville City Commission met Monday Dec. 1st (at the City Hall Community Room, 106 N 12th Street) for a 7pm regular of the Municipal Authority & City Commission. the Consent Agenda by request. A motion to adopt the Consent Agenda is non-debatable. B. Approval of Minutes of the November 17, 2008 Regular Meeting. 6. Discussion, consideration and possible approval of a one-time, lump sum salary increase for personnel. -- approved: a Christmas bonus of $350 for full-time city employees and $200 for part-time. C. Approval of Cemetery Deed for E. Ann Shelton, two spaces. D. Approval of Mutual Aid Law Enforcement Service Agreement with Rogers State University. 5. Discussion, consideration and possible action for approval of a one-time, lump sum salary increase for personnel. -- approved: a Christmas bonus of $350 for full-time city employees and $200 for part-time. (B)(4) Confidential communications between a public body and its attorney concerning a pending investigation, claim, or action if the public body, with the advice of its attorney, determines that disclosure will seriously impair the ability to the public body to process the claim or conduct a pending investigation, litigation, or proceeding in the public interest. (B)(2) Discussing negotiations concerning employees and representative of employee groups. 7. Discussion, consideration and possible action on matters considered in Executive Session. POSTED BY: Angela Long -- DATE: 11/26/08 -- TIME: 12:00 p.m.
Before the commission meeting we will have a short ceremony for the emergency and safety materials that Cherokee Councilor Buel Anglen and Miss Shelby Phelps helped to pay for. 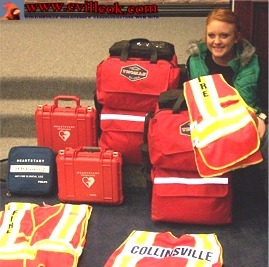 In a brief ceremony before the commission meeting, the City of Collinsville officially thanked Shelbi Phelps (who with an assist from the Cherokee Nation and many other donors) completed a long term effort to provide a defibrillator for Collinsville. The emergency equipment shown Monday totaled over $8,000 and also includes 2 ALS trauma bags (a shrunk down versions of ambulance equipment that are carried on 2 firetrucks), new federally required reflective vests, and training units. The fire/EMS department now has 5 defibrillator. 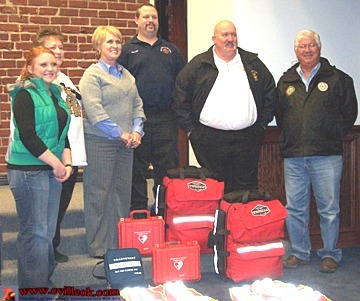 L-R (above) Shelbi Phelps, Pam Porter (City Commissioner), Pam Polk (City Manager) , JW Miller, Russell Young (Fire Chief), and Buel Anglen (Cherokee District 8 Councilman).